Web hosting services can be pretty sly when it comes to their billing cycles. While there are tempting hosting offers at lower than $3 per month, you’ll soon learn that you have to pay at least pay for the whole year to start using their services. So are there any hosts with an actual monthly payment option? The good news is there are — but you’ll have to find needles in the haystack. As a matter of fact, you need to manually go through each hosts billing process to find out for yourself. This list has been partially ordered according to ratings from the largest user-generated web host reviews on the internet, WhoIsHostingThis. As an U.S. recognized Green Power Partner, GreenGeeks’ goal is to become the best green energy web hosting company in the industry. Of course, $9.95 is considered a pretty high price for a web host (shared hosts can be as low as $3). But something you need to know when it comes to renting a web hosting service is that the longer you pay, the better the offer. Hostwinds is specialized in low-cost hosting and aims to provide quality services at a fair price. For that reason, they offer a nice monthly billing cycle of only $6.50 per month. 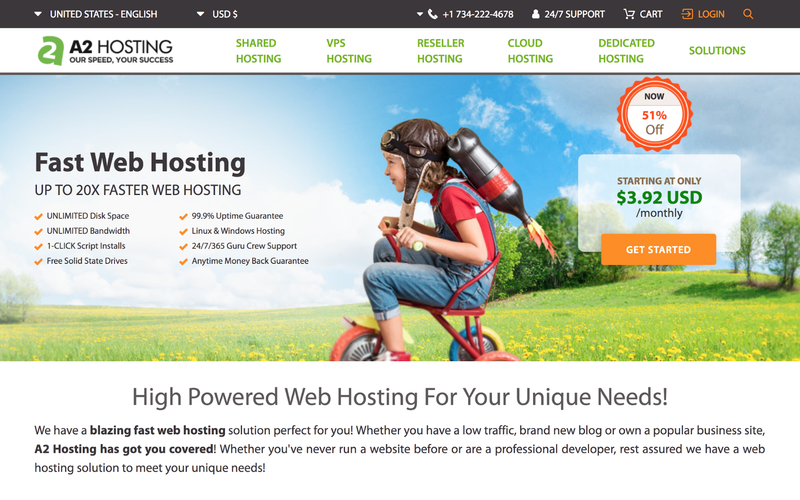 Hostwinds is a relatively new web host, founded in 2010. With features such as instant setup and a 99.9% uptime guarantee, They made sure meet all users basic needs. Hostwinds also boasts a good 24/7 customer support system via tickets that are usually answered within 15 minutes. 1&1 was founded back in 1988, claiming over 10.5 million users worldwide. And the good news here is that 1&1 also offer a monthly billing cycle, starting at $8.99 per month including a free domain name and free setup. While 1&1 make no claims about their uptime history, all user data are simultaneously stored in two locations. So if one server fails, the other will take over to ensure all website’s uptime. TMDHosting was launched in 2007. Despite not being the biggest host out there, they have grown to over 60k users in only 6 years. Although TMDHosting doesn’t make any claims about their uptime guarantee, they rarely have any complains. On top of that, they pride themselves with very quick support, sometimes even going as far as resolving issues within 5 minutes. This is a rarity when it comes to more popular hosts (like BlueHost or iPage) where customer support can take up to 20 – 30 minutes to get back to you. Considering all factors above, TMDHosting is a good low budget host for anyone who prefers monthly payment. Host Metro was launched in 2003, dedicating their service only to shared hosting. While there are mixed opinions when it comes to Host Metro, it’s comforting to know that they offer a good 99.9% yearly uptime guarantee, in case they couldn’t live up to it, you can claim a month of hosting for free. Another thing about Host Metro is that they offer a 45 money-back guarantee, a slightly longer offer than most other hosts. Founded in the U.S. in 2003, Arvixe offers a range of services from shared to dedicated hosting. Like many other web hosting companies, Arvixe offers a 99.9% site uptime guarantee, and they offer refund if the guarantee is broken in any given month. There is something you need to know though, during the recent year, Arvixe has been reported to run extremely slow with significant down time overall. Also, the support team has been slow to resolve issues and answer feedbacks. While they used to be a well-praised service, you need to proceed with caution. While One.com doesn’t offer monthly billing, their first year price is even better than any web hosts I’ve seen. In fact, One.com goes as far as offering a free first year hosting (note that you still need to pay for the setup fee). While not well-known in the U.S., One.com still manages to claim more than 950,000 members worldwide. Remember though, nothing good comes with a cheap price. And the same goes with One.com. You can easily host a small, low-traffic site with them, but as an economy hosting, One.com has a lot of upsells to buy more server spaces at the risk of site speed and uptime. In addition, One.com is not the best when it comes to customer support. You may have to wait a long time (I mean days or weeks) to hear back from them. Like TMDHosting, A Small Orange isn’t one of the best-known hosts in the industry but they have grown rapidly over the years. What’s great about A Small Orange is their tiny price of only $5 even for monthly billing cycles. 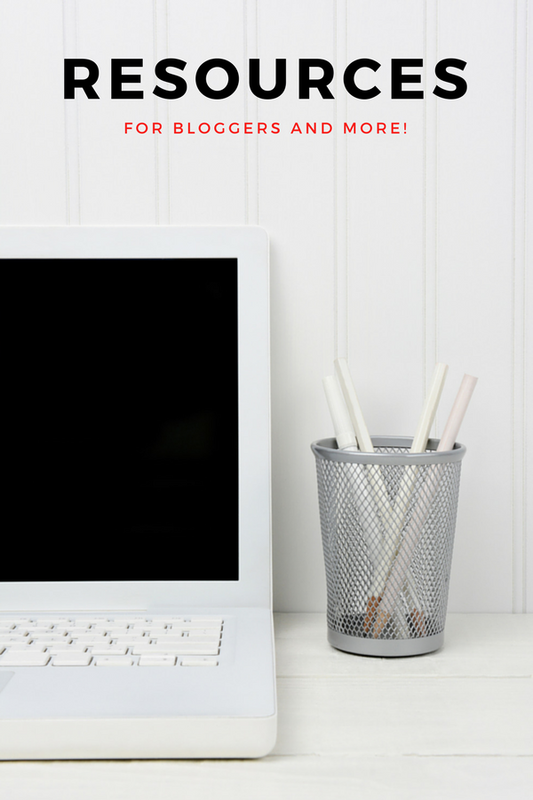 There are reasons why established bloggers like Chelsea Lords, author of “How I Made 40k My First Year of Blogging” chose A Small Orange over BlueHost. That said, A Small Orange has harvested a deal of controversial reviews, from being the best host to some, to being the worst to others. Bottom line, A Small Orange is a good and reliable host for small websites but lacks robust features for bigger ones. Also a new host, StartLogic is specialized shared hosting. While not the best service out there, StartLogic offers a good price for those looking for an attachment-free monthly billed host. You need to know though, that as an economy host StartLogic doesn’t handle traffic spikes well, so if you are looking to build a small site, go for it. Otherwise this is a not a web host for you. JustHost is a budget web hosting provider that focuses on shared hosting plans. They are known to offer notable discounts upon sign-up and a rare anytime money-back guarantee. Founded in 2008, JustHost has made its mark as an economic host with good support and uptime history. However you need to know that during recent years, there has been reports of severe bugs like all hosted emails marked as spam or datas getting wiped clean. iPower is a sister company to StartLogic, founded in 2001. iPower targets both business and personal users, while offering a relatively low cost service and extensive tools for website building. All new iPower users receive a good amount of free gifts including a drag and drop site builder tool, $50 in Facebook ad credits, $25 for Yahoo!/Bing advertising and $100 in Google ad credits. There has been a lot of mixed reviews when it comes iPower though. While there are little complains about their server performance, iPower are mostly scrutinized for their support not being timely, or able to fix user issues. Another thing you need to know about iPower is that they have no money-back guarantee. In fact, if you want to cancel the service, you’ll need to give one month’s notice and pay a $35 minimum cancellation fee. FastWebHost is a privately held web hosting company started in 2002. They are currently hosting over 200k domains for customers in over 150 countries. While FastWebHost isn’t well-known in the industry, it offers some of the cheapest price I’ve ever came across of only $12 the first year. Aside from a reassuring 99.9% uptime guarantee, FastWebHost also offers 24/7 customer support, their average response time is around 15 – 20 minutes. BulwarkHost started offering shared hosting plans in 2013 with the lowest monthly price ever, $4.75 per month. Despite being a new host, BulwarkHost has racked up some pretty good reputations among professional web host reviewers. Boasting a good uptime history and fast loading speed, BulwarkHost is also known for their above and beyond support. That said, BulwarkHost offers limited monthly bandwidth for each of their plans. This basically means you may get into troubles during traffic peaks, unless you upgrade before hand. Being one of the largest independant web hosting company in the world, InMotion Hosting has established their brand since 2001 with a focus on quality and technically advanced services. As of 2018, InMotion has established themselves as one of the largest and most stable hosting service in the field. InMotion is owned by Endurance International, a huge corporation behind many of the most well-known web hosting brands such as HostGator and Bluehost. Fortunately, InMotion also offers you a monthly payment option for your hosting service for some of their hosting package, such as their Shared Business Hosting Pro package, from $17.99 per month. DreamHost is considered on of the largest web hosting service in the world, with over 400k active users and hosting a grand number of 1.5 million sites. Started back in the 1996 in California, DreamHost has now become one of the top choices for many webmasters all over the world. Being PCMag’s nominated “Best Web Hosting Service” for two years in a row, DreamHost doesn’t disappoint in their service quality. In fact, they were so confident as to offer a 100% uptime guarantee as well as a 97-day money back guarantee. DreamHost also offers monthly hosting options, starting at $10.95 per month. WP Engine is a bit different from other hosts mentioned on this list as they are a Managed WordPress Hosting service (as their name suggests), which means they offer specified WordPress hosting instead of the basic hosting services you usually have. Based in Austin, Texas, they were actually the first in their industry to offer this kind of service, allowing to skip the hassle of installing your own WordPress site, as well as receiving better, more specific WordPress savvy support. In addition, WP Engine also offers monthly billed options — though all WordPress hosting are more expensive than shared hosting plans, starting at $35 per month. Flywheel is another WordPress managed hosting service, and also one of the most popular in the industry, right alongside WP Engine. Aside from being a WordPress host, Flywheel stands out from the crowd for their extensive number of tools designed specifically for freelancers as well as agencies. Flywheel is a perfect choice if you are looking to grow a design or web development business. Flywheel offers monthly billed options starting at $15 per month — a reasonable price for WordPress hostings. LiquidWeb stands out from this list as a specifically dedicated, reseller, virtual private server (VPS), and WordPress server packages hosting. Offerent no shared hosting options, LiquidWeb is designed for those looking to build robust websites. As the old saying goes, you get what you pay for, LiquidWeb doesn’t offer cheap starting prices and may not be a good choice for smaller businesses. That said, LiquidWeb does offer monthly billed options, starting from $69 per month. While this is not a true monthly billed host, you still have a chance to only pay for a trial month at SiteGround. Renowned as one of the best host in the industry, SiteGround is a privately-owned company that mainly provides web hosting services for individuals and small businesses. SiteGround not only has an outstanding user satisfaction rating, but also a detailed list of features and plans to fit your need for the cheapest price. Considering SiteGround is currently hosting over 250k domains and manages over 1,000 servers across three different countries, they are a reliable solution for anyone looking to build a sustainable online website. If you haven’t used a web hosting service before, the whole thing can be a little intimidating… especially if you’re a non-techie like me! Below, I’ll show you the exact step by step process to setup your brand new site with our most recommended monthly billed host, A2 Hosting. To start creating your site go to A2 Hosting’s website (this link opens in a new window so you can reference this guide as you go). Quick note: I’m A2 Hosting’s — as well as other web hosts’ affiliate partner, this means that I’ll get a commission if you use and purchase through my links (which, if you do, I’m super thankful for because it helps me run Bloggingthing and create more helpful content!). Once the page opens, click the orange Get Started button on the right hand side corner. Next up, you’ll be asked to choose your prefered hosting package. 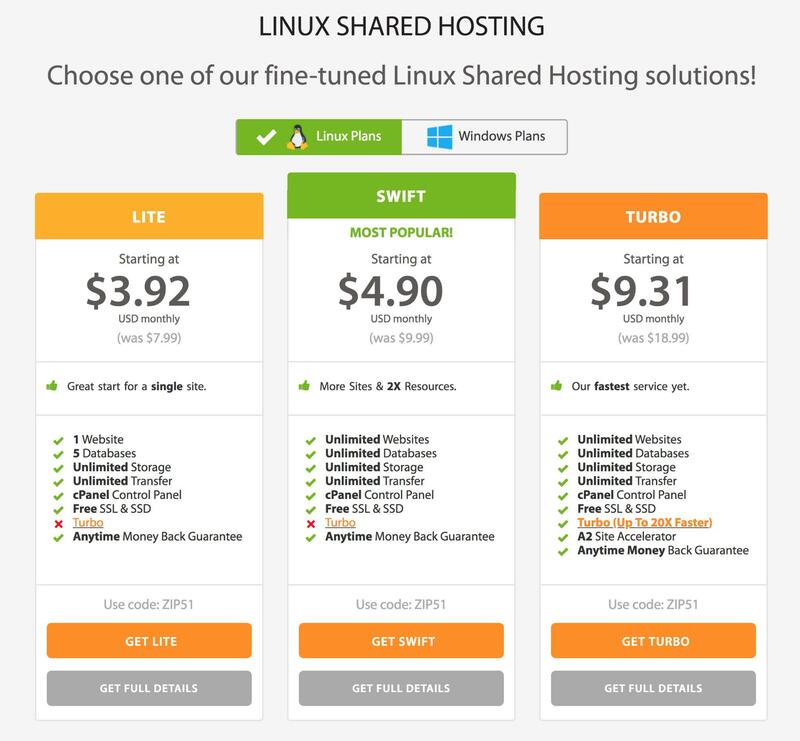 A2 Hosting offers both Linux and Windows hosting, each featuring three different packages from Lite, to Swift, to Turbo. Unless you are looking to host more than one site, I’d recommend you start with the Linux Lite package, it comes with the most affordable pricing and already comes with an unlimited storage, transfer as well as free SSL & SSD (Secure Sockets Layer & Solid State Drive) extras. And of course, you can always upgrade your service as your site grows. Now that you’ve chosen your prefered hosting package, click on the orange button underneath it that says Get Lite (or Get Swift, or Get Turbo), so we can move on to the next step. Should I choose a Linux or Windows plan? For those of you who are wondering about the difference between a Linux and Windows plan, here is a quick explanation for you. Linux hosting usually refers to shared hosting, which is one of the most affordable, and popular hosting service out there. As a matter of fact, most websites are hosted with Linux hosting not just because of their pricing but also their flexibility, as Linux hosting is compatible with both PHP and MySQL, meaning that you can install well-known and loved Content Management Systems (CMS) such as WordPress, Joomla, Zen Cart and more, onto your site with relative ease. If you are a non-techie (like me) and are just looking to create a hobby or business site or blog with an easy to use Content Management System (CMS) like WordPress, then you’ll definitely want to go for Linux hosting. Unless your site requires technologies that are unique to the Window Operating System such as the ones mentioned above, you don’t need a Windows hosting. On the next page, you’ll be asked to choose your domain name. Here, you are offered a few options, either you can buy a new domain name from A2 Hosting, use an already existing domain name of your own, or use a subdomain (your-domain.a2hosted.com) from A2 Hosting. As you can see, A2 Hosting doesn’t offer free domain names like some other hosts. And I’ve noticed that their domain name pricing can be quite a bit higher than from other domain registrars such as Namecheap, which offers domain names from as cheap as $0.88 (with .com domain names coming at around $11.98 per year). So if you want to save up some, I highly recommend you purchase your domain name over there (it’s my go to service when it comes to domain names 🙂 ) and choose the third option, “I will use my existing domain and update my nameservers”. Your domain name is like your brand name on the internet, it’s how others’ would find and remember you by (for example, my domain name is Bloggingthing.com). When it comes to domain names, the shorter, the better. So make sure every words counts (like You-Tube). On the next page, you’ll be asked to configure your web host. Including your billing cycle and other additional options such as SSL certificate, backup service, priority support etc. Make sure that you use a working email address since this is where your login information will be sent. Quick note: At the time of purchasing my host with A2 Hosting, I only have to pay $4.90 for the first month because they were offering a 51% discount. Their usual pricing actually comes at $9.99. Alright, next up you want to make sure you choose the right Billing Cycle. On the first drop down menu, choose the first option “1 Month Price – $9.99 USD”. As you can see, like most other hosts, A2 Hosting also offers special discounts, the longer your billing cycle. This means you can save $1 to $2 per month if you choose yearly billing cycles. Do I need any extra features? DropMySite Offsite Backups — Having a secure backup for your site is extremely important for any webmasters. In case of of bugs or security breach, you may need to restore your data lest your site becomes dysfunctional. A2 Hosting offers backups at a pretty reasonable price starting at $1.99 for 5GB. That said, there are many other methods to backup your site, so this is not mandatory. Now, A2 Hosting offers a super quick way to install WordPress by just a click of a mouse within your Configure page. Below Configurable Options, you’ll find Additional Options, where you can choose to Auto-Install a whole host of Content Management System (CMS). Simply click on the dropdown menu and choose WordPress and A2 Hosting will automatically pre-install it and send you the login information via email, once your hosting account is created. Once you’re done, click the blue Continue button. On the next screen, you’ll find the Review & Checkout page. This allows you to double check your hosting options, verify if you’ve chosen the right billing cycle, domain name, configurable options etc. Once you’re satisfied with your options, click the orange Checkout button. On the next page, you’ll be asked to enter your account information (name, email address, billing address etc.). 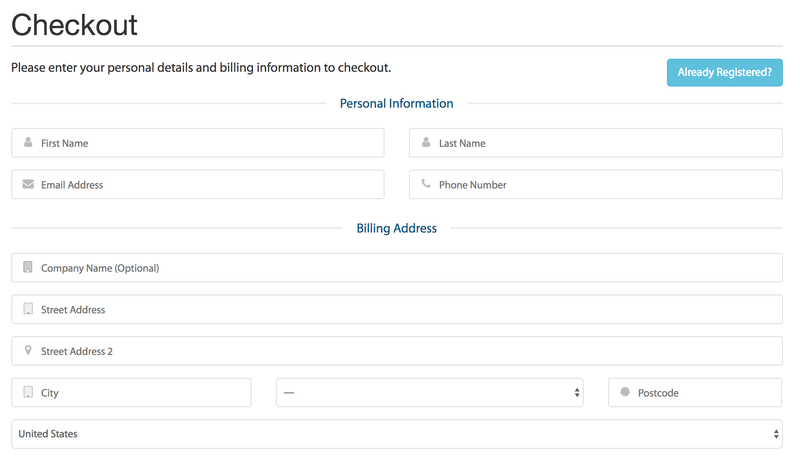 Once you’re done filling in your information, scroll down to the bottom of the page to enter your billing information. A2 Hosting offers multiple payment methods such as Credit/ Debit card, Paypal, Skrill and more. Choose your preferred method, and if necessary, fill in your credit card handle. Next up, check the box “I have read and agree to the Terms of Service”, then click on the orange Complete Order button. On the next page, you’ll see the message “Your order is being reviewed and will be processed shortly!”. This means that you’ve successfully completed your order which is sent to the A2 Hosting team for manual review for security purposes as well as to avoid spam sites. Once your site is approved (which it usually is within less than 24 hours, I’ll show you how to speed up this process below), you will receive an email with your WordPress login information. Now you’ll want to login to your email account (the one you used to at checkout) and find an email titled “Order Review :: A2 Hosting”. As you can see, A2 Hosting is giving you an option to speed up the review process of your site by contacting the support team. In my experience, my A2 Hosting site was reviewed and approved within 3 hours after contacting support. So if you also want to hurry up and start building your brand new site, follow the steps bellow. On the email, click on the link to your Customer Portal (or simply click on the link here). After logging into your account, you can click on the Open Ticket menu at the top of your screen, right next to account. On the next screen, click on the green Billing button, and then you’ll want to write a quick note to ask for a quicker review of your order. In my experience, the team at A2 Hosting only took a couple of hours to get back to me with my account reviewed and approved. All you need to do now is wait for an email titled “A2 Hosting :: Your WordPress installation details”. 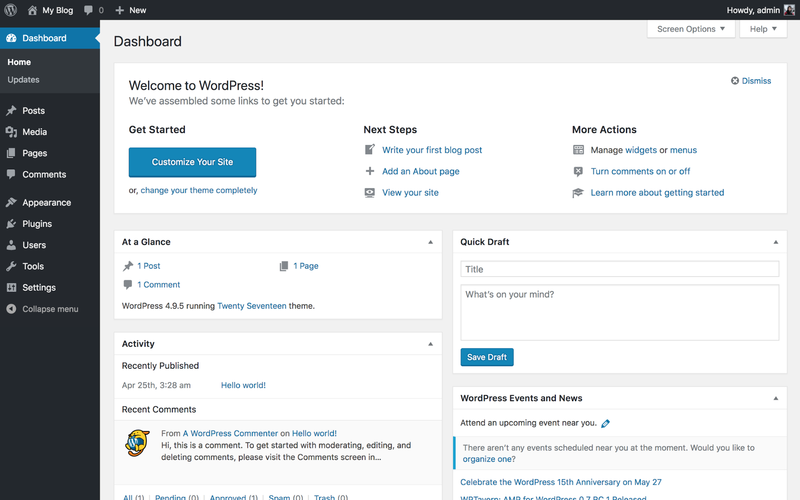 A2 Hosting has gone ahead and pre-installed WordPress for you. In this email, you’ll find all of the information you need to sign into your new WordPress site! Click on the “Control Panel” URL to start using your site. This will take you to your WordPress login page at your-site.com/wp-admin. Before you do anything else, take a moment to bookmark this page to access anytime. Then enter your WordPress username and password. As you can see, the admin password in my email was encrypted and I am guessing yours is too, which means we don’t know yet the password to our WordPress site. The quickest way to get your WordPress password is to click on the Lost your password link below the WordPress login box. Then you’ll want to enter your email address and wait for a Password Reset email with a link that you can use to change your WordPress site’s password. 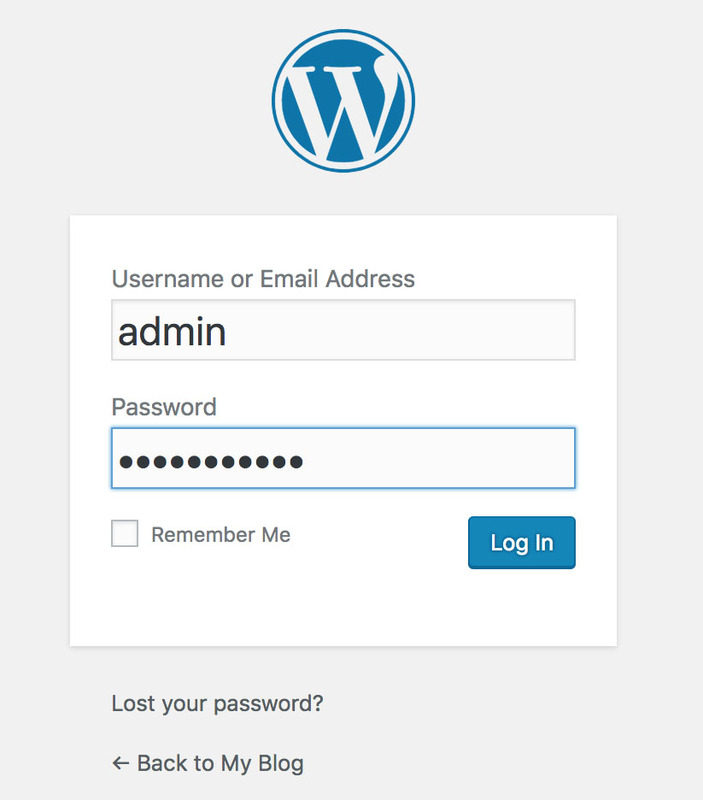 Finally, after you’re done with that, you can use your new password to login to your WordPress site. You’ve just successfully created your WordPress site! From now on this might just be the space where you’re going to change the world. After you’ve logged in, you will be directed into your WordPress dashboard. Webmasters and bloggers usually refer to this page as the WordPress back-end. The front-end being how your site looks to your readers, and the back-end is where all the magic happens — your control panel. At this point, the site is completely yours to customize however you want. You can start by changing your theme, write new posts, add new pages, anything. This whole site building thing can certainly be intimidating at first, so here are a few tips and tricks to help you make the most out of your brand new site. Life is a continuous journey of discovery, always. So the more you learn, the closer you are to achieving your wildest dreams. WP101.com — WordPress 101 is a tutorial and guide site with hundreds of videos on everything you need to know about building your site with WordPress. One of the quickest ways to show who you are when you first started with your site is site design. A professional looking and well designed site goes a long way in building authority and trust. You can either choose a free them, or if you are serious with your site and wants a theme with more customizable options (like ecommerce, social media sharing etc.) and a support team that comes along with it, then I recommend investing on some gorgeous premium them over at ThemeForest. They come at pretty a reasonable pricing from $20 to $50 a theme. 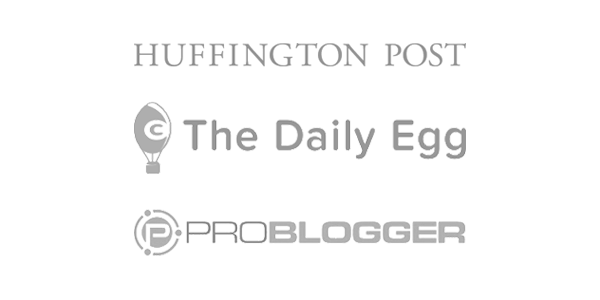 Okay, so a while back, I went ahead and asked over 100 experts for their ultimate advice to new bloggers. And to my delight, amazing guys in the industry from WordStream, Content Marketing Institute and Social Media Examiner replied with some of the most powerful insights I ever heard. If you want to become a blogger, I’d like to share their insights with you as well. Blogging is one of its kind lifestyle where you will be learning something new every day. Sometime willingly and at times because you have no choice. It could be as simple as setting up the email newsletter or configuring that complex Yoast SEO plugin. Hiring a freelancer or developer to design your blog is also a part of learning. Writing conversational blog post is also part of learning & so is making money from the blog. To read every single answers I received, check out my post on 100+ Powerful Beginner Tips From Expert Bloggers. Whether you want to quickly try your hands at creating a website or start a short-term project, I hope you’ve found a suitable host in the list. Remember though, there is a reason why most hosts only offer yearly payments; it helps fund their services and allows them to offer greater promotional prices. That’s how quality hosts like Bluehost are able to offer super low prices from $2.95 per month. Alright, feel free to drop a comment if you have any questions about monthly billed web hosts, I’ll try my best to answer! Monthly billing is very convenient and can you please suggest a good budget VPS hosting having monthly rental of 30 dollars or less? Thanks for this list, Anh! The bigger the choice customers have, the better. I also prefer month-to-month billing cycles, because I find it more convenient. At least, when you move to a new host, and you would like to see whether you’ll be pleased with their services, monthly payments are a great option. I chose to move my website to BGOcloud not only because of the affordable prices and good specifications of their plans but also because they don’t have a setup fee. I was choosing among many hosts, but most of them charged about $20 initial setup fee for their cheapest plans. Thanks for sharing, Johns. 🙂 Always my pleasure to help! Amazing Review. I love monthly billed web hosting service. Best experience ever. This is very impressive and very helping blog. You explain each and every detail information about Web hosting. Thanks for sharing this blog with us. Please keep sharing more blogs. I have had problems with my current web hosting site and I needed to look for alternatives. Thankfully, I found your blog and saw this in-depth review of high-quality web hosting services. Kudos to you for sharing this awesome compilation. Thank you for the great review. I registered my domain at Name Cheap and set up my website at A2. I appreciate your in depth reviews. Yes, Bluehost is giving the best deal on minimum prices to purchase. I recently purchased hosting for two sites and also recommended to others to choose it. Thanks to bloggingthing for giving the updated knowledge of web hosting deals. Hi Anh, your site is pretty comprehensive for anyone looking for information on blogging.Quite impressive really because of the amount of research you have done to impart important knowledge that is not easy to find and that you have condensed into your site.I like that you also give advice and info on each site and even access to the site itself.The site is neat and attractive, all the adds are pertinent to the site, very impressive well done. Aww, thanks Ivo. 😀 I do try to design and write everything to be as consistent and helpful as I can so this is a huge compliment! Hi, Ahn. Thanks for the hosting review. I wasn’t aware that there were so many choices. I was with 1 & 1 for a while, but I found it confusing trying to set up a site with them. Maybe it was because I had no idea what i was doing and maybe they are more user friendly now. Anyway, none of them are that expensive. Do you think that there is much difference between them or would any one of them work pretty well? Hey Grant, good question there. As far as web hosting goes, I’d recommend you do your research before setting down with a host. The most important factors are uptime (does the host have an uptime guarantee? 99% or 99.9%? ), speed and support (this may not be something you’d care about at first but in the long run a dedicated and on-time support team becomes crucial). We were looking for a month to month set up plan and went with HostGator. We found them a bit deceptive. The plan ended up not being month to month and charged us over $200. We were shocked thinking this was a month to month plan-when it was actually for the whole year. I thought I would pass this information along to others so the same thing does not happen to them. So please double check your plans you are about to purchase before you click! Hey Elizabeth, thanks so much for letting me know about this irk with HostGator. It sure is a pain to expect to pay an amount only to be faced with a much higher one! I’ve just doubled checked with HostGator and they indeed still offer monthly billing cycles, starting at $10.95 USD per month. Have you chosen this option at checkout? If you are still billed at $200, please let me know and I’ll be more than happy to look into this with you and update the information accordingly. Thanks for the helpful article! Just visited HostMetro (on 2/8/18), however, and they no longer bill monthly if I am reading their site details correctly. Seems they require the entire year (or two, or three years for best pricing) be paid in full up front. Haven’t checked all the other hosts yet. Maybe HostMetro should be removed from this list. They no longer fit the title for this article. Hey Falcon, thanks for bringing this to my attention. It sure can be a little tricky as some hosts can just up and revoke on their monthly billing cycles! I’ve just double checked with HostMetro and as of March 1rst, 2018, they still offer monthly hosting plans for their Mega Max Plan (with maximum hosting space and bandwidth, as well as unlimited domain hosting) for $7.95 USD per month. That said, I’ll double check with other hosting services on this list and update accordingly as needed. Hello! it’s awesome the information you give us in your article. Sometimes I get confused about the different hosting services that we can find, but with the information and details, you provided I fell that is going to be easier now to decide what to use. thank you so much! I just want to say I am really impressed with your knowledge. I am still new to trying my hand at an online business, and I am learning a lot along the way. But the amount of information that you have about all of these hosting sites is just incredible. The hosting and upsells are what make me very pleased about being a member of Wealthy Affiliate. I don’t have to worry about the hosting fee, have awesome support as well as training and the tools to build the website. Many times I wanted to be a stay at home mom and work from home online, but I constantly ran into scams, sales pitches promising to help you get a business going with little to no cost and having to pay for every thing needed , and left with no clue as to what I had signed up for. I am so glad that there are honest people like you that are there to inform us less knowledgeable souls. Aww, thanks Lee Ann for making my day. 😀 I really love helping others and it’s words of appreciation like yours that makes it worthwhile. Thank you for the Great list on the different Website Hosts that are avaliable online. I did read your opening statement about online host charging a lot extra for Yearly Renewals. I also know that they can be quite sneaky when it comes to Domain Names Renewal. Can you suggest the best Site Hosting that does not charge like Wounded Bulls for both Hosting and Domain Name Renewals? Hey Jeff, great question. It’s true that some hosting services are just “sneaky” when it comes to starting price versus renewal prices. If you are looking for hosts that charge the same every time, then you’ll definitely want to check out DreamHost and iPage. BlueHost also offers good service and a decent price even with their renewal rate. Great post, loads of usefull information! I have a stupid question for you… If almost every host in todays market can promote their product with “99.x % uptime”, what else is there to compete about anymore? Speed should be pretty similiar too now that they’re in SSDs for most parts. Again thank you for the information and I look forward to hearing from you. That’s not a stupid question at all. When it comes to hosting, although a lot of hosts can claim over 99% uptime guarantee, you’ve got to make sure that they are committed to their promise (for example, do they mention it in their Terms of Services, what kind of compensation are they going to make in case they fail to deliver for any month). As far as speed is concerned, not all hosts are build the same. You definitely want to look out for hosting reviews and tests to see the average speed of each host, as one second more of loading can mean that much more visitors leaving your site. Also, you’ll want to look into hosts’ customer support quality; are they dedicated, punctual and professional? When your site is down or experience a bug, this can be a huge deal to be able to reach support quickly. Thank you for putting together such a comprehensive list of these hosting services. Shopping for hosting can be so confusing, especially if you are new to the world of internet marketing as I am. You’ve included some hosting services in this overview that I had never heard of but now plan on looking into. Thanks so much and I may be coming back to you with some questions as I dig deeper into my research! Hey how is it going? Nicely done work. I am commited to begin a full time blog and hopefully sooner rather than later begin to earn some amount of compensation from it. I can’t afford any type of $50 or $60 deal for a year but also I want/need to start with more than just a single month. So would one.com would be suitable for a web host just to start a single beginner blog? Hope to hear from u soon. Thanks, take care. Do many of these hostings companies support wordpress websites I know a few do like hostgator,Bluehost to name a few but how about the others that I’m not familiar with do they have this option in their dashboard or CPanel to create wordpress since that’s all I know is to set up wordPress sites with Hostgator. Hey Sergio, yes all these hosts support the installation of the WordPress content management system. Thanks for doing this research buddy, very helpful. Very informative writing on different amazing hosting providers and packages. But can you assure me about hostgator affiliate is a scam or not. I lost my first sale comission! Hey Sadhan, I’m sorry to hear about your experience. As a HostGator affiliate myself, I’ve found them to be a delight to work with. In case you lost your sale, could it be due to the user asking for a refund? If not, you can always contact the HostGator affiliate team for support. Thank you for this interesting and informative review of hosting providers. I am very interested in GreenGeeks a company that powers their hosting platform with green energy. It is good to see companies becoming environmentally conscious about their operations. With regards, to hosting services, i think to become competitive having a competitive price as well as good service will help to attract new customers and retain them. Other aspects of using green energy are definitely good and would help to attract customers that are green minded. Wow love your page. I did not know there was so many different hosting sites that you can choose.which ones do you like the best and which ones do you think are the worst? I have always heard of Host gator. I heard they had great hosting. I think i will save this web site so i can come back to it for hosting sites. Thank you for the information. Hi, Anh. I liked your post, and it comes at the right time, because I’ve been trying to find a better solution that Godaddy for a while. I currently use Godaddy as the host service for a client’s website, but I want an alternative option, with a hassle free transfer. Also, I’d like a lower cost, certainly not more. Your options are great, but I still have trouble deciding. Which do you think would offer the best hassle-free transfer? As well as be a cheaper and even better alternative to Godaddy? I’m sorry to hear about your bad experience with GoDaddy. As for a better and more affordable web hosting service, I’d recommend BlueHost, it’s one of the most popular host on the internet with a solid server performance and good support. And they only start at $2.95 per month (if you use my link above, normally, they start at $3.95). A quick Google search comes up with this handy guide on how to transfer a GoDaddy site to BlueHost. First of all I want to say it is interesting that you have the same last name as a colleague of mine that studied in Utrecht with me. Do you know any Anton Nguyen? But, about your post, which is what is what matters here 🙂 I find it really helpful that you explain in detail all the advantages of the different hosts and it is useful for me (now that I am building my own website and possibly more in the future) to know that there are more options out there, outside the yearly payment one. But it seems to me, however, that when you opt for a monthly payment the price is really much higher. I thought the Bluehost, for example, had a yearly payment of around 15 euros? Is this true or am I completely wrong? But I see the advantages of a monthly subscription, though. Thanks for the great post! You are right, monthly billing circles are usually much more expensive than yearly ones. BlueHost starts at $3.95 (or $2.95 if you use my link) per month, which is at least half the price for these hosts. But the inconvenience is if you want a host that does offer monthly payment options, BlueHost isn’t one of them. I’m pretty sure I don’t know ant Anton Nguyen, unfortunately. 😛 Nguyen is the most common last name in Vietnam so there is a slim chance we are related in anyways. Really nice comparisons of the different hosting sites! I actually own a blog and I was really looking for a cheap yet reliable host that includes other services such as webmail, good support etc, other than just hosting the website. Do you have any recommendations that I can try? Hey Eric, that’s very nice of you to try to help your younger cousin. 🙂 I’m not very knowledgeable about servers for games, which are different from normal hosting for websites, but I believe there are specific hosting services for your cousin’s needs. A quick search on game server hostings shows up a few sites such as GameServers.com, HostHavoc and GTXGaming.co.uk. First of all, I kind of like this reviews page. Thank you for setting this up. Do you have a plan for writing an in-depth review of your current web host? Secondly, I miss your regular blog posts. And aww, I’m so happy you enjoyed my regular posts, I’ve been into writing reviews nowadays and haven’t though of topics to write regular posts about but it’s something I’m sure to do sooner or later. All the best to you as well, my friend! Great review of hosting sites. There were a few on there I’ve never heard of. But, then again, it’s been quite a while since I was in the market for one of them. I used Hostgator for quite some time a few years back and I remember that I had quite a hassle with getting SSL working on my sites. And the certificates were a bit pricy and they charged per domain. Do most hosts charge per Domain for SSL nowadays? Thank you for an informative post. It is hard these days to find the right web hosting to fit your needs. In the past I used 123 reg. They were cheap and I had no trouble using their services. I see that they are still around. I will have to compare them though to the ones you have listed here to see if they offer a better deal. Thank you for this. I do remember some time in the past when i was looking for monthly hosting, it was quite a pain to find them. The one that was recommended for me was Arvixe and i really had a bad experience with them. Just like you pointed out, support and feedback is really an issue there. Had it been I found your site back then, I am sure A2 hosting would have been the way to go, because I am really making some sense out of your ratings. Vallery, I’m sorry to hear about your experience. Unfortunately, Arvixe seems to have degraded a bit as a service. I hope you’ve found a good hosting for your site now! Hey Anh, thanks for the research. I think this article will be helpful for those who may not be comfortable with hosting companies that charges 1 year or 2 year in advance. Even though, there is the savings that comes with such arrangement. I heard quite good things from SiteGround hosting service but cant say the same about Hostgator. Norman, SiteGround is surely a solid hosting. While HostGator did garner some controversial reviews (mostly about their customer support), their service are still trustworthy and a good choice for those on budget. Awesome website about blogging. Which one of this web hosting service would you recommend for new comers? I am not familiar with any of the web hosting sites on your website and i use Wealthy affiliates for everything. So what do you recommend for beginners and are there any free web hosting site? This is quite an impressive research that you have done on what monthly web hostings to consider when building a website. 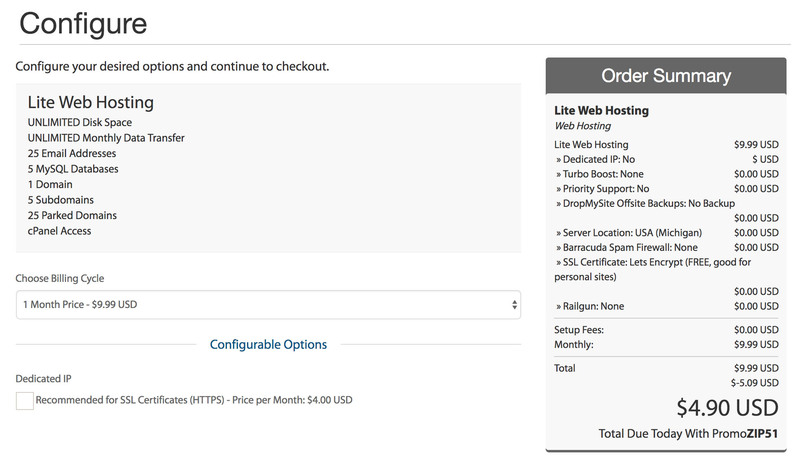 I never knew other web hosting sites that charges a monthly fee outside of GoDaddy and HostGator. I feel that you have done a good job in listing others on here. By the way, I didn’t see any ratings for FastWebHost and BulwarkHost. Would you say that they have good ratings? I look forward to your response. Armand, I’m happy to hear you learnt something new in the article! FastWebHost and BulwarkHost are pretty new in the industry and wasn’t yet rated on WhoIsHostingThis. I would say both of them are decent hosts, especially BulwarkHost, if you are looking for a cheap monthly web hosting service. Remember though, you get what you pay for, these hosts are more geared towards smaller sites. Great article you have here. There are many hosting sites to choose from out there, and it can be very confusing. The issue that bugs me the most is the possible upsells from these hosting sites. I see some of the sites have very good reviews in terms of their technical or customer support. This is very important for me, which is why sites like GreenGeek is very appealing to me. What do you think is most important thing to look out for? Wow! I wish I had found this article before I went through the time and hassle of other sites that bill yearly and quietly include all these extras you don’t realize you’re paying for! Great content here and I appreciate the topic, I haven’t seen anyone else write about this! Thank you for the info I am sure many will find it quite useful. Ella, I’m always happy to help! I am looking for monthly payment web hosting because I do not like a long-term contract. I want the flexibility to switch company which can give better benefits and offers. With this information, I can laser zoom in on the one I like best! Thanks for your effort in compiling this list of monthly paid web hosting. This really save me up tons of time! I’m glad I can help, Edmund! Excellent article on hosting. You have done a lot of work researching all of these platforms. The only one I have had experience with was Hostgator, and they are pretty good. Now however, Wealthy Affiliate hosts all my sites, as it is just so much easier and quicker. I have never looked back. Wow, I didn’t know there were so many web hosts out there. I am also surprised some of the top names weren’t even on the list such as Godaddy and Namecheap. Are these others really better than these two? I am also shocked that Hostgator is so far down the list. Thanks for making this post. It will come in handy for later research. Jason, Godaddy and HostGator are certainly some of the most popular hosts out there and to some extent they can be more trustworthy than some hosts listed above. This list is only focusing on monthly billed web hosts. That’s a huge list you have shared but if I will switch to some other hosting will surely go for BlueHost. Going over your list of hosting companies I see you have quite a few to choose from with a few of them with great ratings and relatively cheap rates. From the list of businesses you feature here do they also have training for developing a website or are they just hosting companies with no website builders or training? Travis, all hosting companies listed have basic trainings on how to build a website, and of course features to do it as well. In fact, it’s those are the norm for most web hosts. Hi, what a huge amount of information here… I love it! Never even heard of some of these hosting companies, will need to bookmark some of them to give them a try in the future. I noticed you didn’t cover BlueHost? I’ve only used them so far and haven’t ever had any issues etc. Mason, I’m glad you enjoyed the article! The reason I didn’t cover BlueHost even though it’s one of my favourite host is because, unfornately they don’t offer a monthly payment cycle. Hi, thanks for taking time to compile this list of hosting companies. Wondering what GreenGeeks does to call themselves a green energy web hosting company. I don’t dispute their claim, just wondering what they do to make that claim. Also, are the ratings your ratings or from another source. I’m not disputing, just asking. Thank for the informative article! Great to read it mate!